Info: Created on 24th January 2011 . Last edited on 21st March 2012. Niiiiiice! Very creative and stylish! I love the form of the letters. 10/10, and a contender for a TP. Well done! I hope you’ll add more characters. I really like the sketches! Ditto Tylo. LOVE THE SKETCHES!!! I think S could be less blocky (see C), but awesome anyway. 10/10. Complete the font, please! It's very interesting and usable. Go on! I'm working on a super fat lowercase right now. 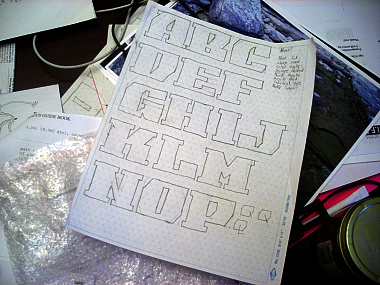 I've always thought that sketching out a font gives you more room for thought and less encouragement for repetition. Setting a high standard and trying to follow it is much more effective than setting a low one and trying to raise it. @SSaamm: do you think you'll finish the LC ? Think this one really deserves it and even much more, it definitely could become an outstanding full set ! Is it still on the rails ? I hope you won't give up. Congratulations! FontStruct Staff have deemed your FontStruction worthy of special mention. “thunky” is now a Top Pick.